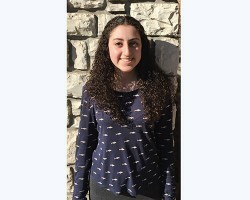 Batya Stein, a Bruriah senior from Highland Park, has been selected as one of the nation’s top high school scholars and named a National Merit Scholarship Finalist. Coming just weeks after being accepted early action to Princeton, Batya’s extraordinary scholastic achievement has earned her the National Merit Scholarship Finalist honor, attained by less than half a percent of all high school students across the country. Batya and her family were quick to focus attention on those who supported her success. Batya praised Bruriah and cited its many opportunities to explore and excel as contributing to her high academic achievement. “Our teachers look for our strengths,” she said. “They match us up with opportunities to grow. Batya cited a junior year STEM project as an example of how she was encouraged to create and innovate at Bruriah. For Batya, the STEM courses have been formative, piquing an interest in multiple disciplines and setting her on track to study engineering or medicine after high school. Before Princeton however, Batya plans to spend a year in Israel, studying at Nishmat in Jerusalem. “I look forward to being in Israel for a year and learning with young women from all over the world,” she said.